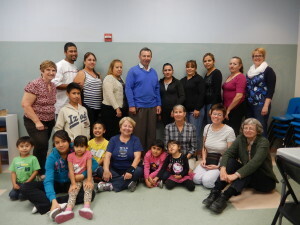 Adult ESL students and teachers. 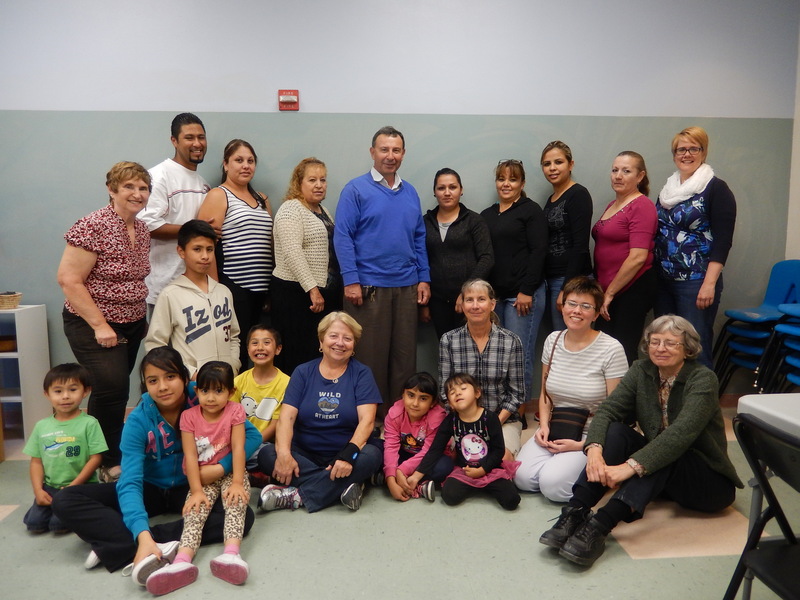 Adult ESL: Serving immigrant adults in the community. Contact: Connie Molecke, conniemolecke@gmail.com. Tutoring volunteer Sara Maley works with a student. 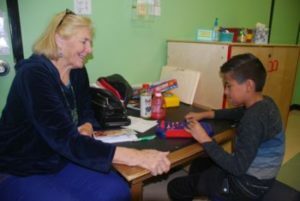 After School Tutoring Program: Providing one-on-one tutoring to at risk students in our neighborhood. We meet on Mondays from 4-5:15 and on Wednesdays from 1:00-2:30. Students in grades 2-5 are enrolled in the fall and continue through April. We welcome volunteers. Training, support and extensive materials are provided. Contact: Carol Oslund, astp.carol@gmail.com..
Bosque Restoration: Restoring an adopted site in the Rio Grande Bosque. Contact: Ed Wallhagen, ed.wallhagen@gmail.com. Change for the Future: Supporting local social justice agencies with the loose change collected during Sunday services, and educating members about the agencies’ work in the area. Contact: John Ellig, bjellig32@gmail.com. Family Promise: Interfaith program to provide meals and shelter to homeless families through a national nonprofit committed to helping low-income families achieve lasting independence. Contact: Paula Fisher, fastfins@comcast.net. Food Pantry: Shopping, packing, and distributing food to those in need. Contact: Rebecca Gracey, maryrebeccagracey@gmail.com. Grower’s Market: Summer sales of members’ produce to support the work of the Food Pantry. Contact: Janelle Campbell, janellec42@yahoo.com. Highway Clean Up: Maintaining a two-mile stretch of the Sandia Crest highway. Contact: Linda Harmony, lindaharmony@comcast.net. 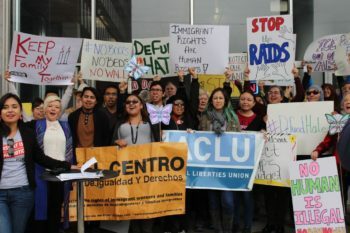 Immigrant Justice Task Force: Supporting the immigrant community and promoting immigrant justice through education of our congregation, collaboration with other Immigrant Justice organizations,outreach to our immigrant neighbors, volunteer engagement, and financial support. Click here to learn more, or click here for a list of current volunteer opportunities. St. Martin’s Hospitality Center: Serving meals at a local soup kitchen. Contact: Nancy Cushman, njcushman@yahoo.com. 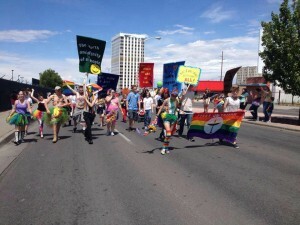 Welcoming Congregation: Supporting the LBTIQ community. Contact: Mara Hoffman, weemais1@gmail.com. Animal Advocates: Seeking to better the lives of all animals. Contact: Margaret Keller, mikeller1@comcast.net. Dining for Women: DFW is a national Giving Circle organization. Participants come with a dish and a donation—and learn about the month’s featured program to support women and children in developing nations. Meets at 6 pm in the Memorial Hall, on the third Wednesday of the month. Contact: Sonja Pulvino, ginkgo59@hotmail.com. Earth Web: Caring for the earth. Contact: Marilyn O’Boyle, marilynlea@aol.com. Fair Trade Market: Selling Fair Trade coffee and chocolate. Contact: David Barbour, david.v.barbour@gmail.com. 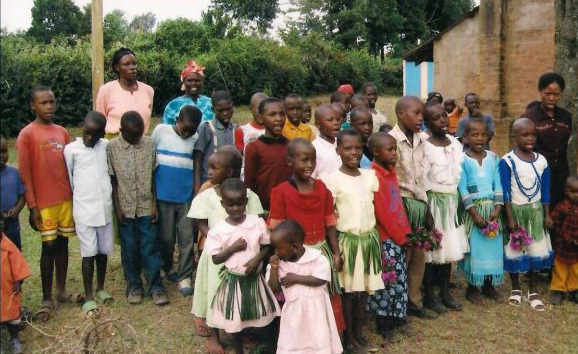 Children from our sister congregation in Kenya. Kenya Partner Church: Supporting our partner church in Kitengela, Kenya. Contact: Rev. Angela Herrera, aherrera@uuabq.org. New Mexico Faith Coalition for Immigrant Justice: An interfaith alliance working for immigrant justice. Contact: Renee Wolters, renee.wolters@gmail.com. Unitarian Universalist Service Committee: UUSC advances human rights through grassroots collaboration. In more than a dozen countries throughout the world, UUSC fosters social justice and works toward a world free from oppression. Visit: uusc.org.